As a small business owner, you know as well as anyone that reputation is an invaluable asset to your business. What is said about your brand is important--especially when it comes to what is said on the world wide web. Plain and simple, the internet is the main tool a consumer uses today to help with their purchasing decisions. Research indicates that 88% of consumers trust online reviews as much as personal recommendations and 97% of consumers say that reviews influence their buying decision. We know that customers use reviews to influence their purchasing decisions. In order to use that information to your advantage, however, it's important to make sure that those reviews are seen by the customers so once they're ready to purchase. Let's take a look at the various strategies for utilizing your reviews to increase your SEO rankings and thus increase the overall success of your business. How do we know reviews matter? 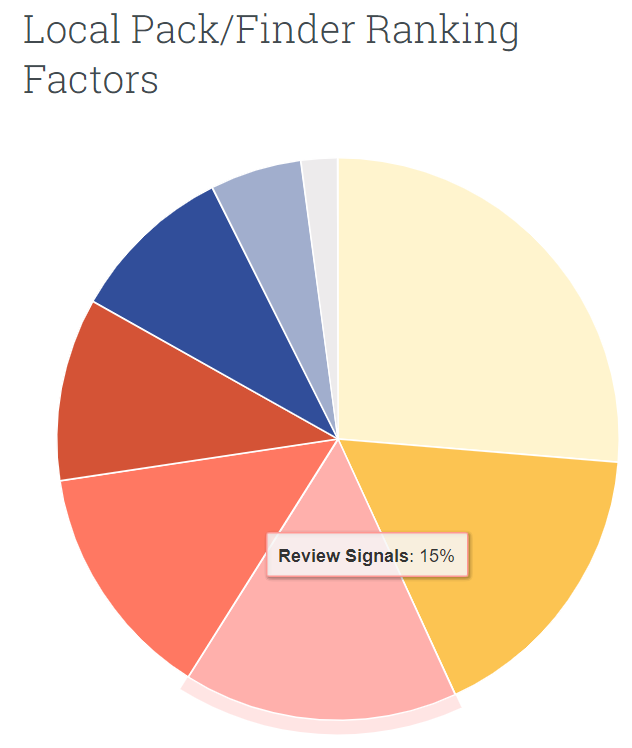 According to MOZ's 2018 Local Search Ranking Factors, "Review Signals" (Review quantity, review velocity, review diversity, etc.) ranked as the 3rd most important factor, accounting for 15.44% of how Google ranks a local business in its "Local Pack" search results. This is almost a 7% increase from 2015 when reviews were valued at only 8.4% for ranking a site in Google. 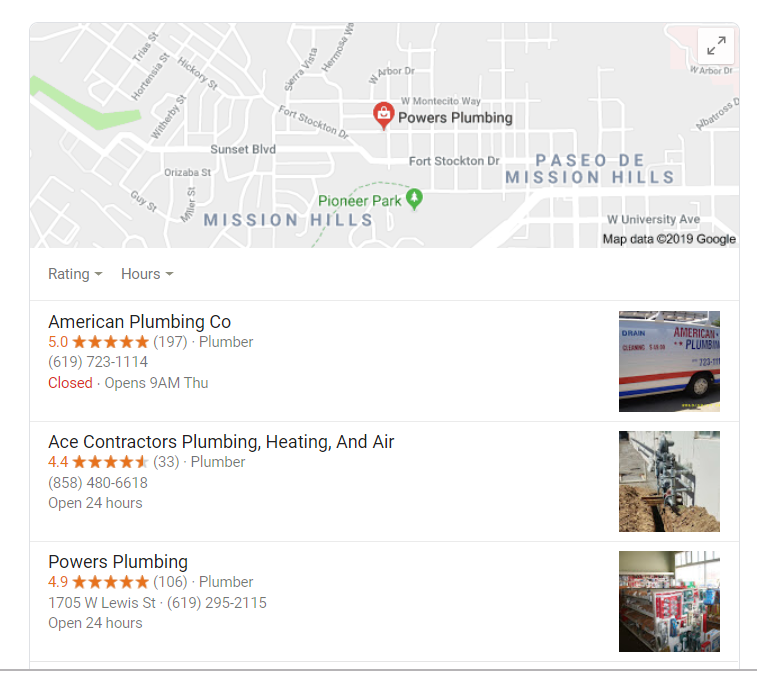 The Local Pack is the box of local search and map results that appear at the top of relevant searches in Google. Needless to say, reviews are a key determinant in making sure your business ranks higher in localized Google search over your competitors. Now that we know reviews matter to SEO rankings. Let's dive into how reviews can help with your rankings and SEO strategy. You may be asking yourself at this point, "well I see that reviews are important when it comes to ranking higher with SEO, but why is that? Why is Google putting a considerable amount of emphasis on reviews and my ranking?" Well there are some pretty simple reasons behind why Google uses reviews to help with its rankings. With Google, it's all about "who you know"
Well, sort of. When Google first started ranking pages back in the day, it was all about the "credible" links you had associated with your site and page. While this is still true today, there are also other auxiliary factors associated to your site--reviews being one of the main ones. Getting links from other sites is one of Google's ways of understanding how trustworthy your site is. The more links you have from other credible sites, the more Google will reward your site with increased visibility. Furthermore, reviews inform Google that your business really exists and how past customers have felt about their interactions. Google is the most proficient and powerful scanner in the world. It reads your site and every site on the planet in order to help it make sense of the internet. If it has more content to read about your brand, Google develops a better understanding of your site giving it the ability to determine when and how to rank it. Understanding this gives you a tremendous opportunity. By having more reviews on your business, you are inherently giving Google more content to consume around your business, which helps the search engine better understand your business. When Google understands your business more, it rewards this information with an SEO boost. The reviewer is writing the review for other potential customers while simultaneously giving Google rich information to help further boost your SEO. And of course more clicks means a better bottom-line for you in the end. Humans have always relied on one another for the growth of our species. This is clearly illustrated with reviews and referrals. Take for instance an individual making a purchasing decision between two electricians: one with a two-star average in reviews and another with a five-star average. The sensible and rational consumer will most likely go with the five-star review average and click-through to their site. It's common knowledge within the digital marketing community that a higher click-through-rates on a site result in an SEO boost. Research shows that if a high percentage of searchers choose your site from the search results, Google correlates higher click through with credibility and will reward your site with better rankings. Reviews, especially positive reviews, play a huge role with click through rates. When you attract more clicks with your positive reviews, you'll see a boost in ranking follow as a result. Whether you're just starting out and looking to get your first online review for your small business or looking to enhance your overall review acquisition strategy, a lot of what is entailed remains pretty consistent. First and foremost, make sure you're asking your customers for a review. It seems almost too simple to be mentioned here but more often than not, this step is passed over. A customer will have no idea how important a review is to you unless you let them know. Make sure you're asking the right customers in order to get that positive review you deserve. All too often, small businesses send out mass email reminders to past customers prompting them for a review of their experience. If you send a reminder to the wrong customer, you may be presented with a negative review. Reputationbuilder.com suggests a negative experience is 3X more likely to leave a negative review than a positive. You don't want to shoot yourself in the foot here if you don't have to. Work to get reviews on all of the major review sites that help bolster SEO. If you have a review acquisition strategy, make sure you are using the right websites to get the right reviews. Google, Facebook, and Yelp are the top-dogs here. If all of this sounds overwhelming, rest assured it doesn't have to be. Thankfully, with tools like Review Booster from Housecall Pro, all of the work can be done for you. With Review Booster you can ask the right customers for the positive reviews you deserve. You can do all of this with the help of easy to use templates that are sent to your past customers and prompt them with writing reviews on all the top review sites. All in the name of increasing SEO. So take action now and be the first business your future customers see. If not, your competitors will.